Size of this preview: 800 × 482 pixels. Other resolutions: 320 × 193 pixels | 2,000 × 1,204 pixels. 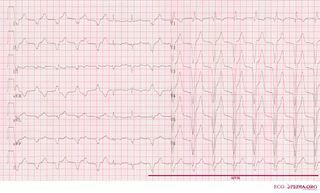 An example of accelerated idioventricular rhythm in a patient who was treated with primary PCI after anterior myocardial infarction due to a proximal LAD lesion. The first 5 beats and last 9 beats are AIVR. In between two narrow beats are seen of which the second beat is probably a normal sinus beat. AV Dissociation can be seen in leads V1 and V2. This page was last edited on 26 July 2007, at 07:57.